Know left from right, top from bottom, etc. Activities Download [CLICK HERE] – unzip and import to SketchList 3D. 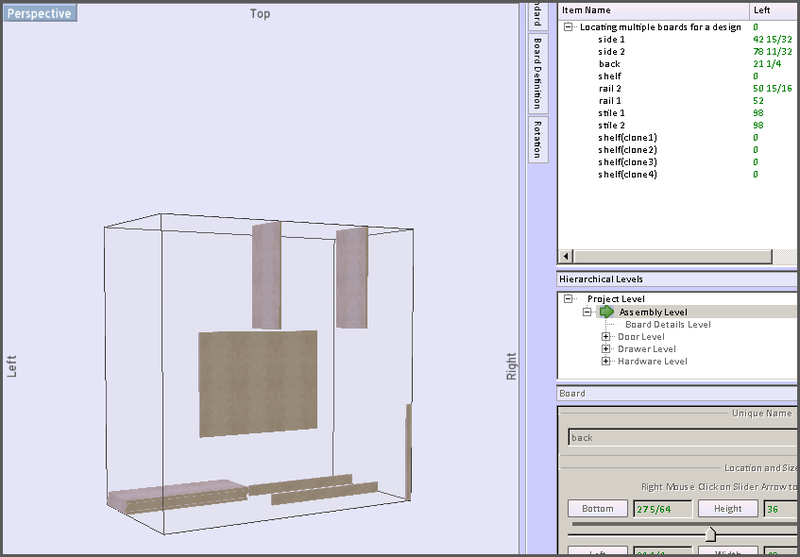 Open and load the project Learning SketchList 3D. It may appear a bit different than the video due to last minute changes. 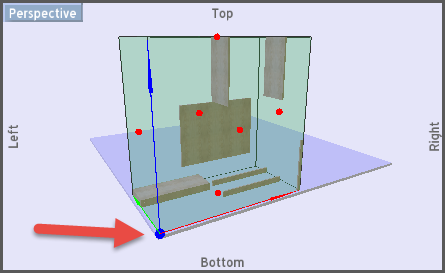 The objective of this lesson is to understand how boards are located in three-dimensional space. You will understand how the boards fit into the assembly (or other container) using the concepts of distance from left, bottom, front of that assembly. Building on that concept of distance from left, bottom, front you will be able to relate individual boards in the assembly two other boards in a way that achieve your design. In order to accomplish this you will learn to use the tools available in SketchList 3D. 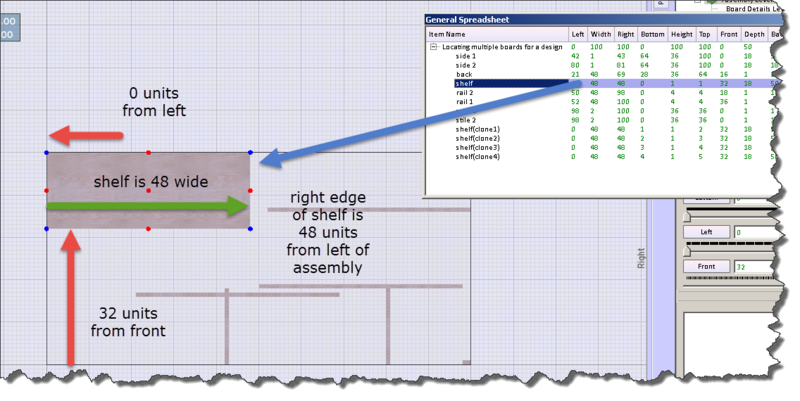 The project “Learning SketchList 3-D” contains an assembly named “locating multiple boards”. The first thing to do is start SketchList 3D. Then select the project “learning SketchList 3D” and load it. The assembly “locating multiple boards” will be on your screen. In this lesson you will learn how to set the values of left, bottom, and front of each board to align them and combine them as necessary to create your bookcase. Those values of left, bottom, and front are the distances that each board is from the left, bottom, front of the assembly. A board labeled shelf with a left value of zero meaning it is zero units from the left edge of the assembly. Additionally the board shelf has a bottom value of zero meaning it is zero units from the bottom of the assembly. For convenience sake SketchList 3D also provides the distance that the right edge of the board is from the left edge of the assembly. Let me say that again. The right edge of board from the left edge of assembly. 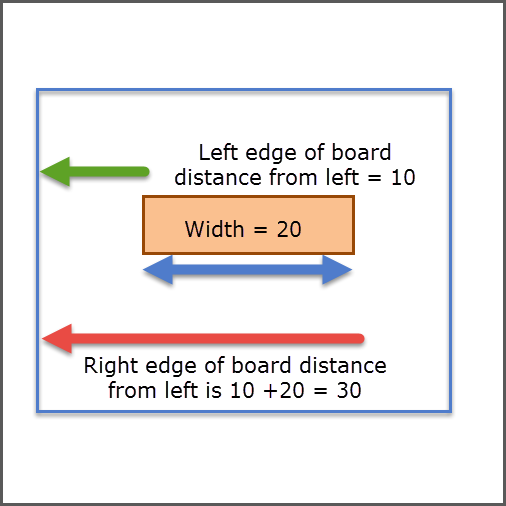 The right edge of the board is the distance equal to the left edge of the board plus the width of the board. Don’t worry. There are all sorts of tools to help you do this. As you do this several times and gain some practice it will become second nature to you. Important concept. All objects in SketchList 3D are located by specifying the distance the left, bottom, and front edge of that object are from the left, bottom, and front edge of the containing object. A container is an object that holds other objects. The most obvious is an assembly exists as a containing object for boards. The tools in SketchList 3D make managing objects in 3-D space very easy. But still you should know this concept. Tools for locating or moving boards in an assembly. Sliders appear under the triplets in the board form. 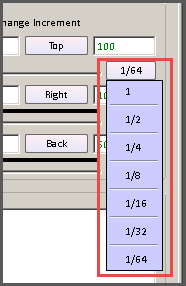 By clicking the button to the right of each slider bar you can change the size or increment of the slider. Sliders move boards from left to right, top to bottom, front to back. There are excellent way of moving a board from somewhere in the assembly to the right, top, back of that assembly. There also a very good way of just moving a board out of the way so you can continue to design. Blue dots – blue dots are shown at the corners of each board. 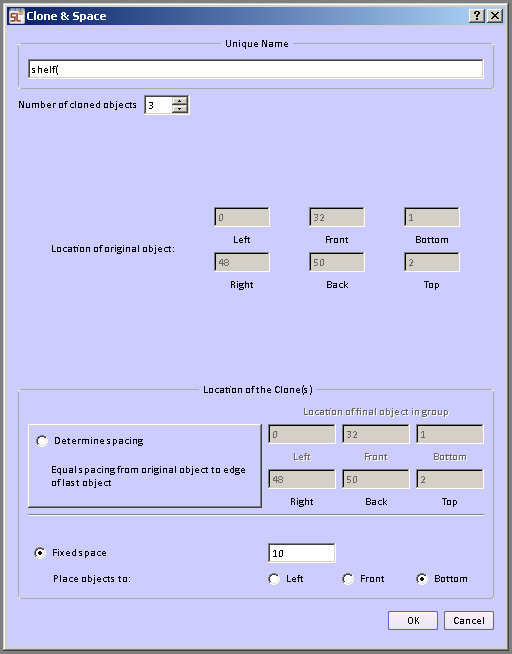 Right clicking with your mouse where the cursor is on the blue dot opens the following form. The distance of that blue dot from the point of origin of the assembly is shown. You can change any or all of the values and click okay to move that corner – and thereby the board – where you want it. 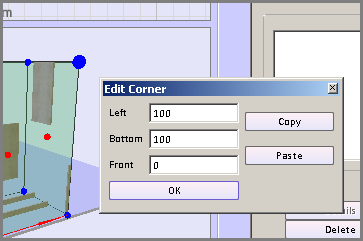 A very useful variation on this technique is to click the copy button on the edit corner form. Then select a blue dot from another board, right click that blue dot and click the paste button. Because the left, bottom, and front values of the blue dots in the two different boards are the same those boards will meet at that point. This is an extremely useful technique. You can left click on the blue dot and hold the shift key down on your keyboard. Then while holding the left mouse button on your computer you can drag that board anywhere you wish. Triplets – triplets are a way to represent the numerical values of the six edges of any board as their distance from the point of origin of the assembly. 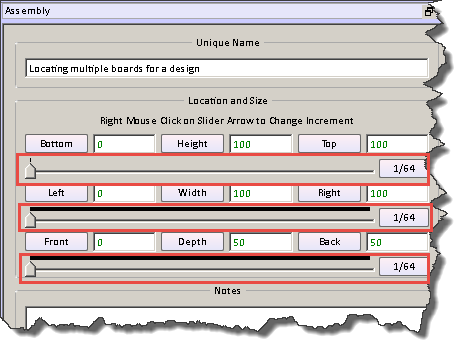 In the example below if you edit the value of distance from left to zero, keep the width at 20, the right edge of that board then is located 20 units from the left edge of the assembly. In the example below if you keep the value of distance from left as 10, and edit the value of the right edge of the board from 20 to 10, the width becomes 10. You can edit one or two values of the triplet in SketchList will calculate the remaining value. 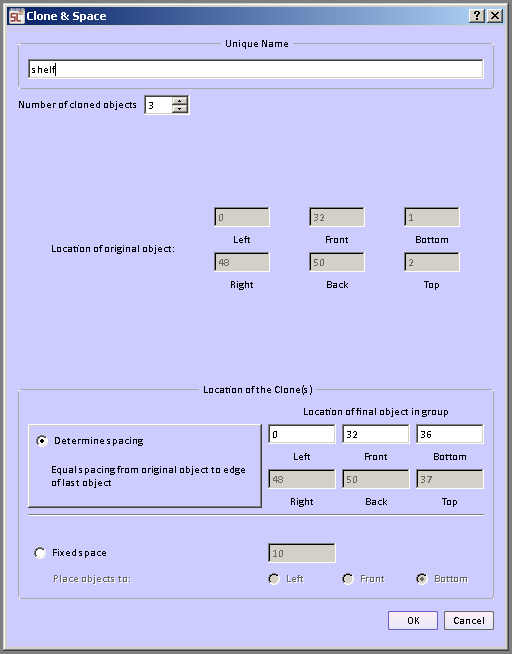 Triplet tool – form. One tool that SketchList 3D provides to manipulate the size and location of objects in three-dimensional space is the form. The name of the form changes to reflect the object selected.That means if you select a board the form becomes the board form. If you select an assembly the form becomes the assembly form. If you select a door the form becomes a door form. If you selected drawer the form becomes a drawer form. If you select hardware the form becomes a hardware form. There are three “rows” in the form. One controls bottom to top movement. The second controls left to right movement. And the third controls front to back movement. This same functionality works on all three rows of the board form. 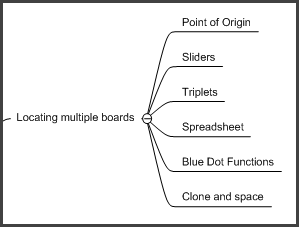 Triplets tool – Spreadsheet – another method to change the location of a board using values of bottom – top, left – right, front – back is to use the general spreadsheet. First notice the item names column in the general spreadsheet. Each row contains a name of a board in the assembly. In addition to the name the spreadsheet contains information about the size and location of each board. The first column of the spreadsheet contains the names of the boards. Columns two through four contain the values of the triplet left – with – right. Columns five through seven contain the value of the triplets bottom – height –top. Clone and space. One other way to locate a board in three-dimensional space is the clone and space function. 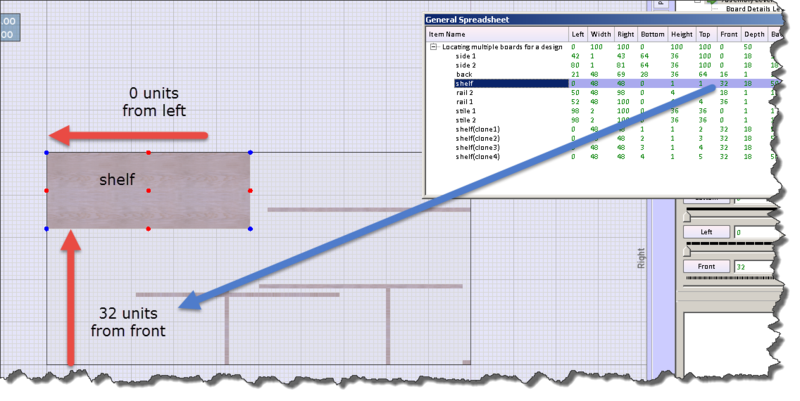 Clone and space will make an exact copy (copies) of a board and locate that copy a specific distance from the original. This is useful when you want to take one shelf and make several copies of that shelf and locate them all 10 inches apart. Select the board to be cloned. Click the clone and space button on the board form. The clone and space a form will open. You can clone and space from the left, from the front, or from the bottom. This of first example creates three boards and places them the fixed distance of 10 units apart from the bottom to the top. Enter the number of boards to be cloned, check the fixed space radio button, enter the distance between the boards, and check the direction radio button. You can choose left, front, or bottom. The next example of clone and space shows how you would set the distance between the first and last board in the set, and have SketchList determine the spaces between the boards. Enter the number of boards to be created. 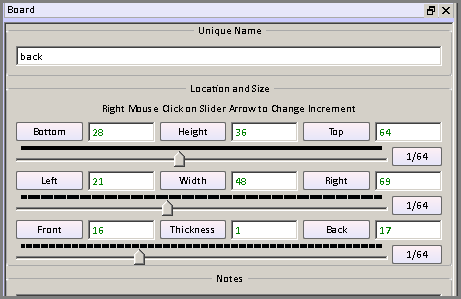 Check the “determine spacing” radio button. In our example we are adding shelves from the bottom toward the top. This requires that you enter the bottom value of the last board in the sequence. The top value of that board will show when you enter the bottom. If the last board in your sequence should have a top value of 48 and the board thicknesses one than the bottom value to be entered is 47. In this case three boards will be equally spaced from the original board to the distance of 48 to the top and/or 47 to the bottom.Clone in space can be an effective way to center a board between two points. For example if you have a style on the left with a left value of zero, and a style on the right with the left value of 46, if you do a clone in space creating one cloned object, selecting determine spacing, and entering 46 for the left value, the newly created board will be centered between the side pieces. There are three activities involved in this lesson. Review the videos listed in the lesson. At this point you should be able to locate a board in three-dimensional space and locate that board in relationship to other boards in that same space to create the design. The design in the videos was a bookcase. There are some aspect of this material that’s confusing please communicate via email or on the site bulletin board. You will discover that these techniques for locating objects in three-dimensional space are exactly the same for all of the objects in SketchList 3D. So while you’ve invested time mastering this lesson, you will use the techniques and tools over and over again in your design process.